When teaching tennis to a new and beginning student I have always emphasised a combination of fun and technique. When a new student books me for a lesson, in the first 5 – 10 minutes I try to find out about him/her: why they want to learn tennis, what do they know about it and if they have ever tried tennis before. For example someone might want to learn so that they can play with their family. Or they consider tennis a good way to stay in shape. Or they are just being brought in by their parents. Whatever the reason, it is good to ask them – you’ll find some interesting answers for why people pick up a tennis racquet. After you familiarise yourself with your new student, it is good to let them know a “very” little bit about yourself – do not bore them too much about your life. Just keep it simply letting them know your name, how long you’ve enjoyed playing and teaching tennis and enthusiastically let them know how glad you are to have the opportunity to teach tennis. 1. Court dimensions and names of the lines – it is important for new players to learn the names of the lines (e.g. baseline, singles side lines, service line etc.) so that when you ask them to practice from a certain spot on the court, he or she should know their way about the court. 2. 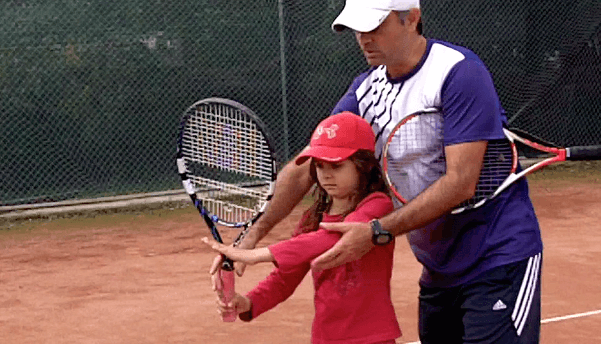 Racquet introduction – explain your student the different parts of the racquet: head, neck and handle. If you want, you can show him/her the basic grips without getting into much detail. 3. Introduce some hand-eye coordination drills to test his/her physical skills. 4. Begin by demonstrating and teaching the basic forehand ground-stroke technique followed by drills and fun games that puts in practice the skills they learn. These are the main points that a student should learn in the first lesson. Make sure to keep it fun and try as much as possible to connect with the student by listening to him/her and allowing them to ask you questions during the lesson. If your student is a child, encourage them all the time and praise his/her effort. It wouldn’t hurt if at the end of the class you have a little prize for him/her (e.g. small candy, stickers etc.). Kids love that and they will continue coming to your lessons when you show that you care. Have fun on the court and write to me if you have any… questions!